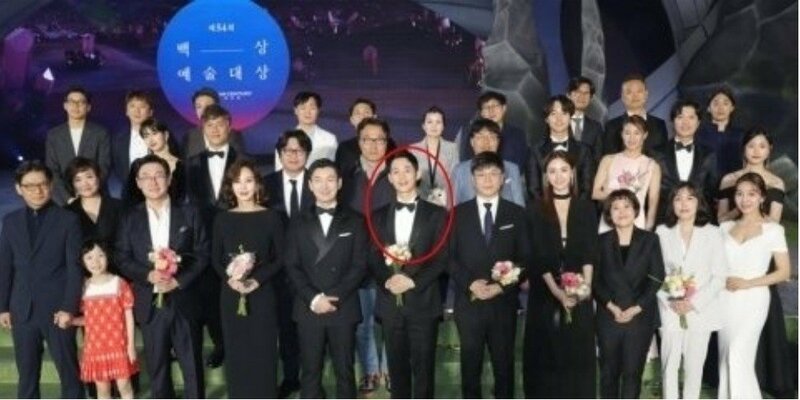 Jung Hae In is swept up in a controversy for his position in the 'Baeksang Arts Award' group photo. On May 3, the '54th Baeksang Arts Awards' took place at COEX D Hall in Seoul. 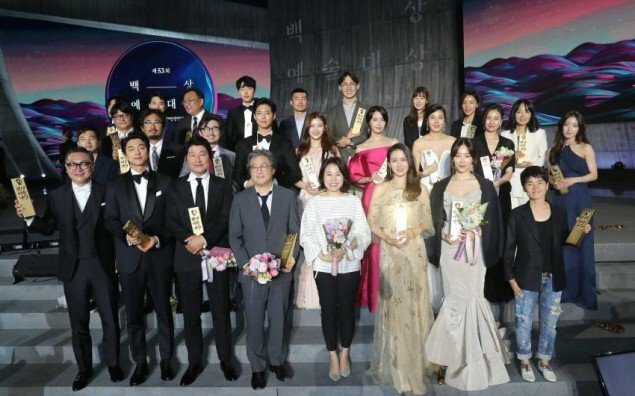 Every year, the winners take a group photo at the end, and it's an unofficial rule for the winners of 'Daesang' (Grand Prize) and 'Best Actor/Actress' to take the first row. The group photo from last year's 'Baeksang Arts Awards' is seen above. Actor Song Kang Ho (winner of 'Best Actor' in film) is third from the left, director Park Chan Wook and scriptwriter Kim Eun Sook of 'Goblin' (winners of 'Daesang') took the center, actress Son Ye Jin (winner of 'Best Actress' in film) is third from the right, and actress Seo Hyun Jin (winner of 'Best Actress' in TV) is second from the right. However, the center position did not go to the 'Daesang' winner this year. The spot was taken by rising actor Jung Hae In, who won the 'Popularity Award' at the ceremony. Kim Yoon Seok (winner of 'Best Actor' in a film) is spotted in the second row. Netizens heavily criticized Jung Hae In for his "rude and unmannerly act". Comments stated, "At first I was like why are they making such a big deal out of this but after seeing the photo I understand... It is kind of messed up. There's not even that many winners and the 'Popularity Award' is right in the center..", "He must think he's a top star already", "Even Suzy is all the way at the end. Who does he think he is to push out Kim Nam Joo and Jo Seung Woo and take the center like that?? ", "Wow, brainless." Some claim that the staff even gestured Jung Hae In to move over to the side but he did not budge. Netizens also pointed out how startled actor Kim Yoon Seok looked in the second row. In response to the issue, an insider told Star News, "Jung Hae In just took the photo as directed by the staff. It's unfortunate how this has become a controversy with negatively edited footages." Despite the insider's defense, criticism toward Jung Hae In is ongoing. What are your thoughts on the issue? Wow this is stupid. Netizens don't have any better false crusade to go on? Seriously doubt any offense was meant, and if he shouldn't have been there, staff would've told him to move.